WASHINGTON—In what is being regarded as a further provocation on top of his already controversial address before Congress, Israeli prime minister Benjamin Netanyahu doubled down against President Obama Tuesday with a PowerPoint presentation on the perils of the Affordable Care Act. “As you’ll see here in this chart, Obamacare restricts freedom of choice for people who were previously insured through their employers, while simultaneously causing insurance companies to raise their premiums,” said Netanyahu, who according to witnesses had finished his original speech criticizing Obama’s opposition to further Iran sanctions and immediately announced he would be discussing the president’s “fatally flawed and unconstitutional” health care overhaul. “Now, if we click over to the next slide, we see that the individual mandate forces many Americans to purchase insurance policies they cannot afford or simply don’t want. 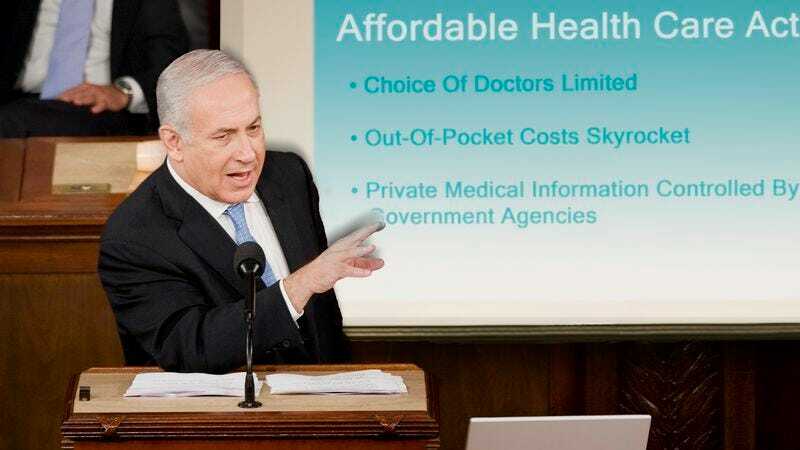 Why should the government be making our health care decisions for us?” At press time, Netanyahu was asking if he might have a few more minutes for an abbreviated version of his PowerPoint on the troubling unanswered questions that still surrounded Benghazi.